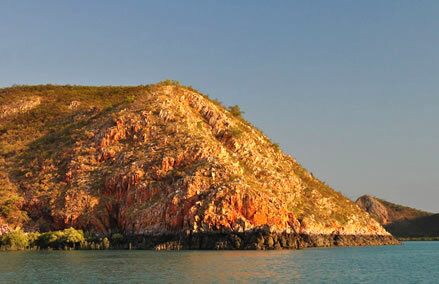 In April 2014 in what it describes as the "most comprehensive, unbiased, well-considered gazetting of Australian holidays to have ever been published" Australian Traveller magazine chose cruising the Kimberley coast, as The Greatest Holiday of Australia. 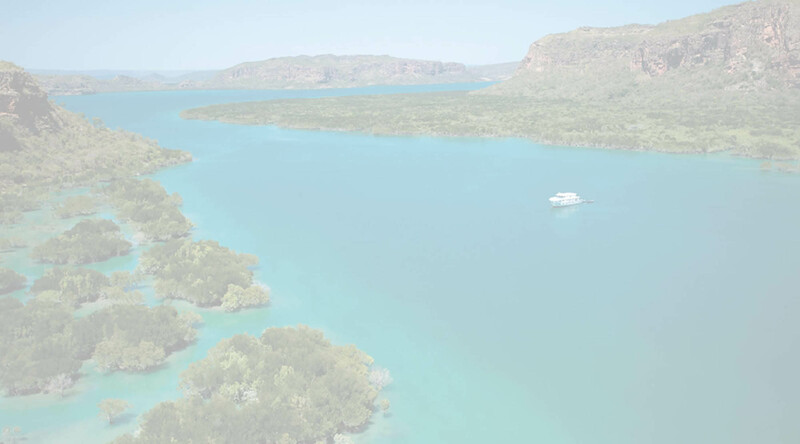 It went on to say that "there's no better way to see the Kimberley and her 2500-odd islands than by sailing around her edges in one of the world-class adventure cruise ships on offer." The Buccaneer Archipelago is a collection of more than 1,000 islands stretching south east from Collier Bay to King Sound. The rugged islands are often known as the Iron Islands due to their rich Iron Ore colouring. Both Cockatoo and Koolan Islands have been mined for their mineral wealth. Crocodile Creek in Yampi Sound is a little paradise tucked away behind the sandstone walls. With the top pool cascading into the lower pool and then onto the creek below, it's a delightful place for a swim or exploration above the falls. 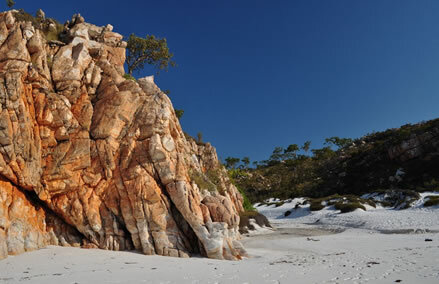 Powder soft pure white sand and turquoise waters; enjoy a refreshing swim at this pristine beach or take the time to climb up the sandstone rocks for some great photography. There are only two waterfalls in the world that run horizontally and both of them are at Talbot Bay. Described by David Attenborough as 'one of the greatest natural wonders of the world', the Horizontal Falls provide a perfect demonstration of the awesome power of the Kimberley's huge ten metre tides. 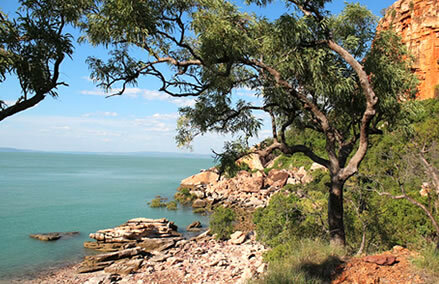 A steep, 10 minute climb from the rocky beach takes you to the most amazing Aboriginal rock art site, with figures painted on the walls and ceiling of a rock overhang. Beautiful views down over Foam Passage to Steep Island. The area is a photographer's paradise. One of the wonders of the Kimberley coast, Montgomery Reef is a spectacle to behold as the entire reef appears to rise from the ocean on a falling tide. 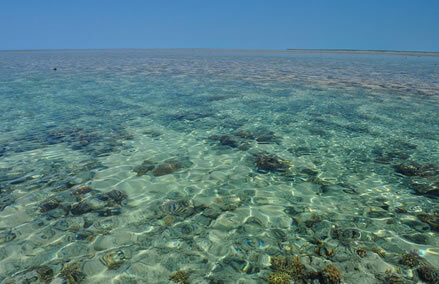 With tidal differences of over 10m over a single spring tide cycle, nearly 5m of reef gradually emerges from the ocean, as water cascades down numerous channels. Visit the mysterious cove at Langii and witness the 'Petrified Warriors'. This is a major cultural site for the Worora people with these remarkable sandstone pillars representing the warriors killed in a Dreamtime battle. 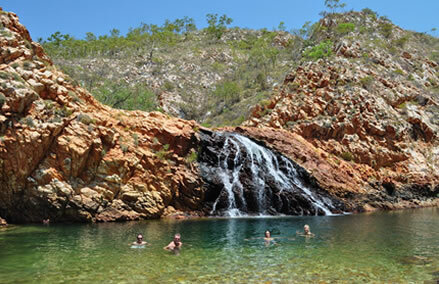 Probably one of the most photographed Kimberley icons, a beautiful terraced waterfall on the Prince Regent River. Climb above the falls for an unforgettable swim in a massive crystal clear pool. Be rewarded with a breathtaking view over the magnificent Prince Regent River in the distance. A stunning river system lined with dense mangrove forests and surrounded by rainforest encrusted mountains. The Hunter is reputed to have the greatest population of salt water crocodiles of any Kimberley river. The river has two spectacular waterfalls, the Hunter Falls and Donkin Falls, both of which drop 90 metres (295 ft). Also a large and unique rock formation can be found at the mouth of the river. The Mitchell Falls are a series of three sheer falls with a combined height of 80 metres. As the river falls over the edge of the Mitchell Plateau it forms the second highest falls in Western Australia. Reached by helicopter, they are most early in the season. 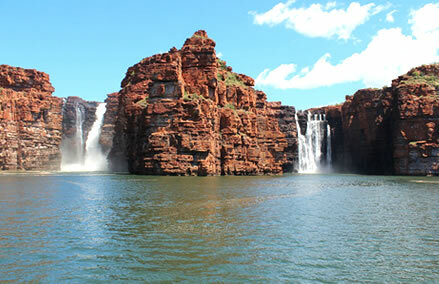 Probably the Kimberley's most spectacular waterfall and West Australia's highest. These towering twin waterfalls are 80 metres high. Cruise captains nose the bow of the boats to within metres of the rock face, right up under the spray. Some cruises offer helicopter flights over the falls and it is also possible to climb up the escarpment to the plateau. A beautiful sandstone cliff lined river with many freshwater creeks flowing into the river. Swim in freshwater pools, fish for barramundi when the tide is right.